Building apartments for families is not for the faint-hearted, but Melbourne developers, Marcus Lyon and Paul Bell, are taking on the challenge. The project on Brunswick Group’s drawing board, inching its way through the approvals process, is a complex of 74 apartments, 12 of which have three-bedrooms. 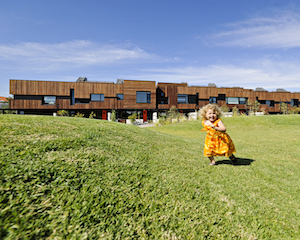 In the centre of the development is a 500-square-metre communal courtyard garden, where kids can play in the sunshine, and there are two community rooms that any of the residents can use. The question is: will couples with children ever buy apartments?